Politically, Lindsay and Romney had similar belief systems; they were liberal Republicans, advocates of gun control and civil rights (Lindsay would eventually become a Democrat). That made them Rockefeller Republicans at a time when Nelson Rockefeller was Governor of New York. Lindsay, at first a member of Congress from New York, had little regard for the political machinations of Rockefeller, even years before his 1965 run for mayor. When Lindsay (reluctantly) began his campaign for mayor, he disavowed public and financial support from Rockefeller; the governor was unpopular in the state and tended to control his patrons, which, combined with Lindsay’s distaste for him personally, led to him rejecting a generous $500,000 donation pledge. That infuriated Rockefeller, which led to a war of words in the press. 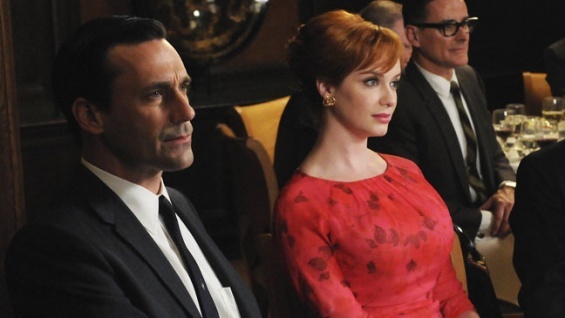 Fast-forward a year, when the episode of Mad Men took place. Francis, who is Betty’s second husband in the show, has gone from working for Rockefeller to the newly elected Lindsay. The new mayor had ambitions beyond Gracie Mansion, however; he eyed the presidential election of 1968. Earning his party’s nomination (especially given the rift between Goldwater conservatives and liberal Republicans) might have been a long shot, but he at least had a shot at the vice presidential slot. Rockefeller also had Oval Office ambitions, but having vowed to exit electoral politics forever (at the time), he backed another liberal Republican for the nomination: George Romney. And the Michigan Governor was much more accepting of Rockefeller’s political support, as his entire campaign would be staffed by Rockefeller aides. Those were the sides: Rockefeller and Romney on one, Lindsay on the other. They still had to work together, given their positions, but behind the scenes, it was ugly. In fact, when Romney made a visit to tour New York City’s more run-down urban areas, it was coming on the heels of the gaffe that would eventually cost him his shot at the presidency: he said that he had been “brainwashed” by generals during an earlier visit to Vietnam, and no longer supported the war. Clearly, calling Romney a “clown” wasn’t much of a stretch for the Lindsay-aligned character. Or perhaps Francis could see into the future and see how George’s son Mitt would turn out and thought it was hereditary. 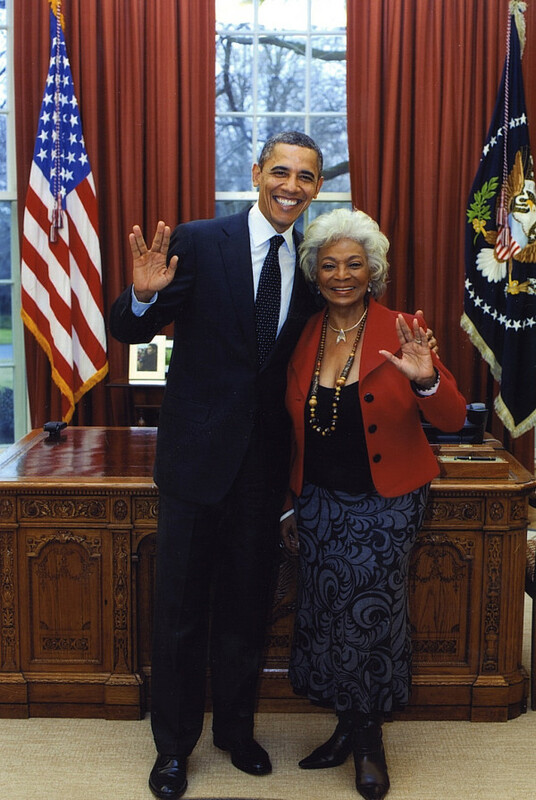 Nichelle Nichols tweeted the above picture, which was taken in the Oval Office on February 29. It is now as official as it is going to get for a while. Barack Obama has obtained enough delegates to clinch the Democratic nomination and it would take a rather major and unpredictable event to change the trajectory of the Republican race to deny Mitt Romney the Republican nomination. It remains possible that Romney might fall slightly short of the number of committed delegates to win, but there are likely to be near 600 unbound delegates, making it easy for Romney to pick up enough to win the nomination. This is ensured by the manner that the party leadership is increasingly backing him, seeing his nomination as inevitable. On the other hand, Joe Scarborough says that nobody in the GOP establishment believes Romney can win. Republican voters are accepting the reality of his nomination, feeling satisfied but only eleven percent are actually excited by this outcome. The same poll also shows that a majority of Republican voters realize that Romney says what he thinks people want to hear as opposed to what he believes. [O]n March 14 and 15, Romney had raised over $3 million in New York and Connecticut. … The Romney campaign had a clever pitch for the event. Schmoozing with his money pals before the events, a Romney fund-raiser pointed out that “slightly more than half the delegates” to the GOP convention at Tampa “are evangelicals.” These true-believer conservatives are averse not only to Romney but to semi-reasonable types like Chris Christie and Mitch Daniels. As a result, said this fund-raiser, the “responsible Republican guys” are “starting to realize” that at a brokered convention “it’s not going to be Paul Ryan and Marco Rubio or Jeb Bush and Paul Ryan, a ticket they could really love. It’s probably Huckabee-Palin or Palin-Huckabee.” That was enough to scare the Wall Street crowd into getting out their checkbooks. With Republicans already showing little enthusiasm for Mitt Romney’s probable nomination, I wonder how the Huckabee and Palin supporters in the party accept this characterization of Huckabee and Palin as not even making his “semi-reasonable” list.